In 2008, Prefense LLC began producing a revolutionary, non-alcoholic, long-lasting hand and skin sanitizer with a patented formula that enables its antimicrobial protection to last up to 24 hours or through 10 hand washings. It is different from most antibacterial products because it is formulated without alcohol. This ensures it will not dry the skin and cause redness, chapping, and flaking. Most hand sanitizers on the market contain more than 60 percent alcohol, increasing consumer risk of skin irritation and decreasing the ability to fight infection over time. Significant alcohol content also makes these hand sanitizers highly flammable. Every day we come into contact with microbes, bacteria, and viruses, and hand washing is the best way to avoid the spread of germs. 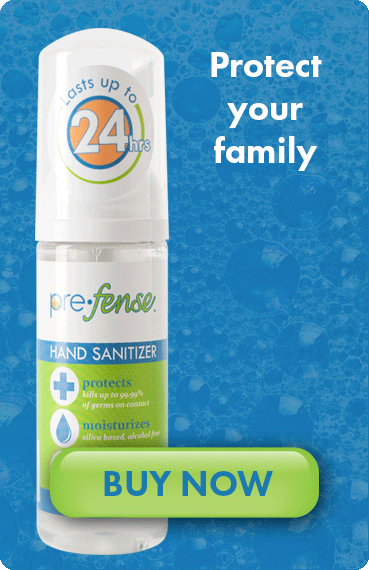 By using Prefense on your hands, you are protecting yourself from microbes, bacteria, viruses, and germs for up to 24 hours, even after using soap and water to wash your hands. When applied, Prefense creates a hydrogen bond with the skin cells, instead of just covering the skin’s surface. This bond locks Prefense protection to the skin until its sheds naturally after 24-60 hours. Skin cells can shed through excessive hand washings.